You might have seen people in gyms and BJJ classes walking around with funky tape all over their arms and shoulders. You may be surprised, or not, to find out that this isn’t some silly fashion statement or the latest style craze. It’s called Kinesiology Tape. Kinesiology tape is special, sticky strips of tape that are placed over a person’s injured body-part in order to aid in it’s recovery. It doesn’t even have to be a full injury, many people use the tape to cover sore or inflamed areas that they feel are close to injury, rather than already outright injured. The tape itself is made of elastic cotton and stuck to the skin using an acrylic-adhesive. No latex and the strips can even be worn for days at a time without any negative side-effects or problems. As the tape is similar to human skin, it allows your body to move without restricting your range of motion, meaning that you can go about your day normally without the tape getting in the way. Using tape is a really great way to make sure you take care of your injuries and inflammation without sacrificing your freedom of movement or having to stop training altogether. Top athletes from a variety of different disciplines and sports have adopted the tape so you can expect to see a lot more of it over the coming years. With many companies jumping on the bandwagon, the market has been flooded with inferior products that either don’t work or don’t stick to the skin properly. Physix are not one such company. Their new FDA and CE approved kinesiology tape has been proven to stick to the skin no matter what conditions, even staying solid during the entirety of a hot yoga class. You can apply it and forget all about it for several days as the tape will not wear off and it’s so comfortable that you just forget it’s even there. Physix have included a free, 82 page, illustrated eGuide that guides you through just exactly how to apply the tape, where best to apply it, how to get the most out of it and just general tips on how to use the product. This product has been manufactured under ISO standard and is both FDA and CE approved. If you have sensitive skin or certain allergies, then you’ll be happy to know that Fitdom Revive tape is both hypoallergenic and latex-free. No nasty surprises or irritation when taking the tape off. It is both sweat-resistant and water-resistant too, so you don’t have to worry about it peeling off mid-workout. Though despite this tough adhesive, you won’t have any issues when removing the tape either. Kinesiology tape can sometimes seem a bit overwhelming if you’re using it for the first time and have no idea what you’re doing or how to apply the tape. Fitdom are one of many top companies that include a handy eGuide for no added cost that explains the process in a detailed, yet easy-to-understand way. The main thing that stands out about kinesiology tape is the vibrant colours. You can, of course, have more low-key styles like black, white, etc. but it’s very likely that you’ve seen people taped in loud, rainbow-like colours. If you’ve seen those people and were excited to use colourful tape and interesting designs yourself, then Rocktape are the company for you. They offer more colour and style options than we can even count, with every possible colour accounted for and many specific styles such as camouflage, cow spots, biohazard, etc. With a collection this vast, there’s no doubt you’ll be able to find the tape to suit your perfectly. All tapes made by Rocktape have incredibly strong adhesive that lasts for days; it only comes off when you decide to take it off. KT offer their tape pre-cut. This may not seem like a big deal, but it can make a huge difference in both comfort and how long the tape stays on properly for. The pre-cut tape means that there is no frays on the end. When the tape is frayed, it eventually unravels, peels off or just generally causes you discomfort. You’re putting the tape on in the first place to prevent discomfort and pain, so you want to make sure that there’s no frays. The pre-cut tape also means that you only use the exact amount of tape you need and don’t need to mess around with scissors trying to get the perfect length. As you can imagine, this means that one roll of KT tape lasts far longer than many other tapes out there. KT are one of the leading brands when it comes to kinesiology tape and this is the second of their excellent products on our list. This tape differs from their original model in that it is even more heavy-duty. It’s far stronger and lasts even longer. This is the tape that you apply when you want to protect your weak points whilst still training hard. Other tape is fine for when you’re just recovering in the office or running errands across town, but if you still want to give it your all in your gruelling training sessions, then KT Pro is the way to go. As the “pro” in the name suggests, this is the exact brand of tape that many professionals go for, including top level sports men and women such as olympic athletes. 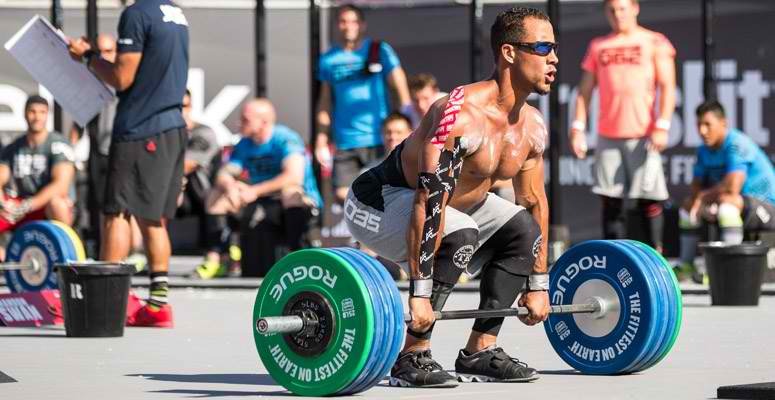 Many people swear by kinesiology tape. It allows them to go about their daily activities and get their training in without aggravating old injuries or making new ones. The tape is comfortable to wear and low-profile, unlike a thick, ungainly knee or elbow brace. So comfortable in fact, that you’ll likely forget you’re wearing the tape altogether. Get yourself some kinesiology tape and enjoy your pain-free days.